With the recent changes to Spirit Blade, the Knight-Enchanter specialization has changed quite significantly, but it is still powerful. Now, instead of using Spirit Blade all the time, you want to use it only when you have high Spirit Blade charges (90+), as shown by the tooltip above your skills bar. Using Spirit Blade will expend the charges, so you will need to build them back up every time. As a result of these changes, this updated build focuses on rapidly building Spirit Blade charges. To build charges with the new spirit blade, you simply need to deal damage with a spell, or a normal staff attack. Each instance of damage will give you 5 charges (10 with the Amplified Blade upgrade) , up to a total of 99 charges; this is why skills like Energy Barrage are absolutely required for this build, since it attacks multiple times. 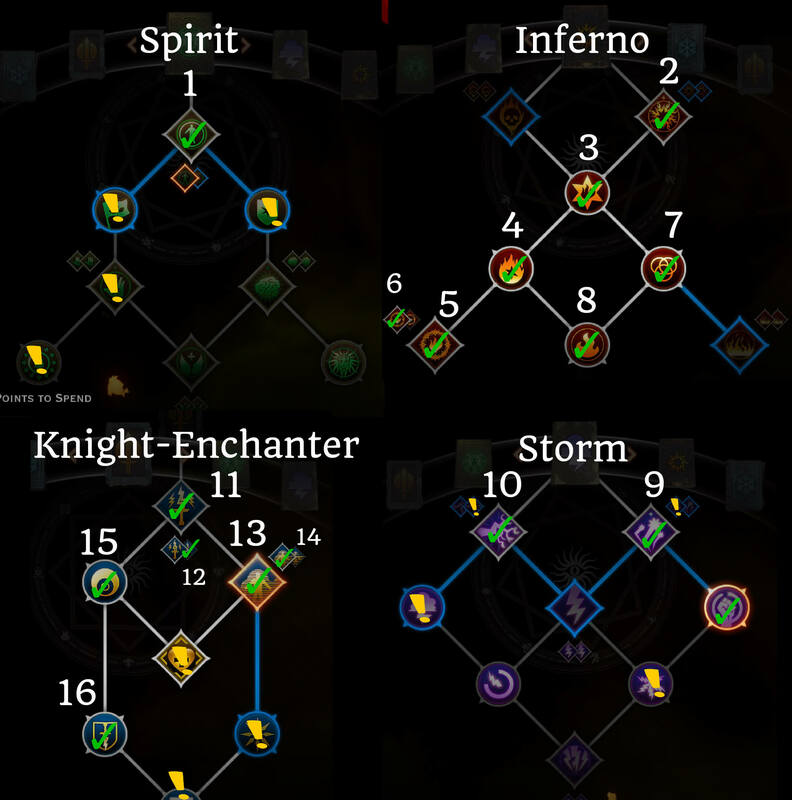 Note: you can vary this build in 2 ways – by going for Chain Lightning for your 10th skill point, or by taking Fade Step for more mobility instead; this is up to personal preference. I take Chain lightning because it attacks multiple times (up to 6 with the upgrade) and complements Energy Barrage for quickly generating Spirit blade charges. The basic idea behind this build is to deal lots of magic damage with your spells, while also building up charges quickly to use Spirit Blade for massive damage. Activate Barrier either yourself, or from another mage. For your 8th ability, you can either take Resurgence (Knight-Enchanter Focus skill) or use Mark of the Rift if you are playing this build on your Inquisitor. It is really up to you which skill you prefer – Resurgence is better for helping your party survive, while Mark of the Rift is better for pure damage. To conclude, you will notice that the core build requires only 16 points; I decided to make it as accessible as possible since KE is such a popular spec. Because of this, you have lots of ways to spend your later points (marked by the yellow exclamation mark in the build screenshot above). If you’re looking for more damage, I would take the optional Storm skills ; if you’re struggling with mana/survivability, I’d take the optional Spirit points instead. As always, if you guys have any questions or suggestions, please let me know in the comments! Hey, I was wondering what you think about not using Fade Cloak and going just with Energizing or Frost Step? I’m trying to go for a full melee Knight Enchanter with Blade of Tildarion, so I find Fade Step quite good for a gap closer, a repositioning tool and an escape. Although Fade Cloak is amazing, I do like to keep chain lightning for quicker Spirit Blade charges. What do you think? Do you think its a good strategy on Hard difficulty? Also, Im wondering whether I should put guard on hit bonuses for a melee enchanter. 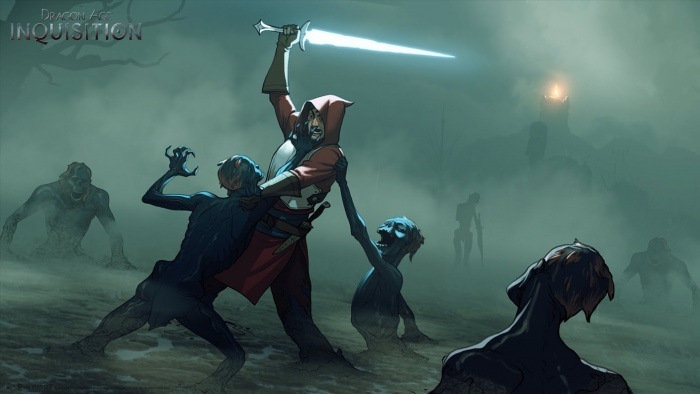 For some reason I just dislike the idea of a ranged KE and I do like the blade quite a bit, but I’m not sure if the guard would be a nice addition for survivability or it simply wont be enough. am i the only one who looted a magical sword with aoe electricity dps (mage only) out of crestwood astrariums? i ‘ve been searching the pages but found no answers: am i supposed to keep hoping in finding some brutal schematics like this weapon? or just a bit stronger ones? Single player KE was unchanged/not nerfed, right? As for the best build…before the nerf it was definitely KE. Now it’s kind of hard to say, it depends more on what you want to do. In terms of highest damage, I actually think a no-specialization build that takes both upgraded fire mine and static cage is very good. I actually feel like energy barrage is Really amazing in this build, especially since each hit can crit separately. This allows for flashpoint to be much more beneficial. On top of that, it allows you to diversify you damage based off of staff type for whatever enemies you encounter. This is especially nice because your best ranged damage with this build is normally fire based, and if you are fighting a fire resistant dragon, your cold damage is normally gonna be lacking. Energy barrage not only gives you decent single target damage of whatever type, it also shred’s resistances so that your fire damage spells are not totally useless. Odds are, you are grabbing this anyways to get to the passives below it. I generally take it in favor of dispel for my inquisitor. If i need to, I run Vivienne as a support with dispel and resurgence. I’d be interested to know what others think about this.